Each year in September efsli organises its AGM and a conference with a national interpreter organisation. Interpreters, trainers, students, and users of interpreting services participate in this exciting event. 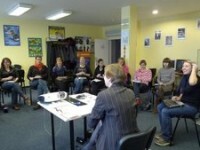 It gives a great opportunity to exchange information and expertise with participants from all across Europe and beyond. If you want to know where the next efsli conferences are held, please look here. efsli has developed a special guide for the organisers of the efsli conference. Organisers will receive the guide and a budget template to help them organise the efsli event. Organisers will also be assisted by one contact person from the efsli board, for any questions that might arise. If you would like to receive the guidelines, please send an email to the secretariat: secretariat @ efsli.org. Every two years efsli is organising a trainers’ seminar together with an interpreter training program in Europe. efsli trainers are professionals who are involved with educating and training (student) sign language interpreters. They play a vital role in the development of the sign language interpreter profession. If you would like to host an efsliT please contact efsli. For your information efsli created a Guide to organise the efsli trainers’ seminar. You can download it as an pdf file >>>here.